CHILDREN from Blackhorse Primary School in Emersons Green had the chance to visit the workshop where the Bloodhound supersonic car is being created. The car, which will attempt to create a world land speed record of 1000mph next year, is under construction in Avonmouth. 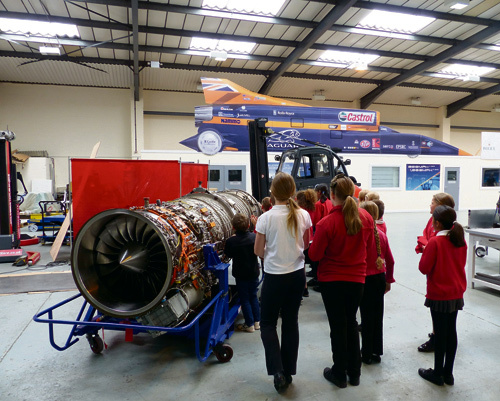 The 20 children, from Years 3 to 6, saw the EJ200 jet engine and other main components of the car. They also met Bloodhound’s build team and technicians from the Royal Air Force (RAF) and the Army’s Royal Electrical Mechanical Engineers (REME) working on the project, and learned of some of the extreme facts and figures involved in the ambitious attempt. The pupils took part in a model rocket car workshop where they worked in pairs to design and build miniature race cars from foam blocks which they shaped and refined before going out to the test track area to race them. They learned about chassis design, team work and time keeping with the Bloodhound team using physics, engineering and mathematics to help them understand the science behind what the cars could achieve. Bloodhound’s primary aim is to inspire a generation, bringing science, technology, engineering and mathematics to life in the most exciting way possible. A further series of school visits are planned to take place during the summer.